Figure 9 Value of altering window and level. (A) There is no apparent clot in the left lower lobe pulmonary artery at a window of 450 and a level of 50. 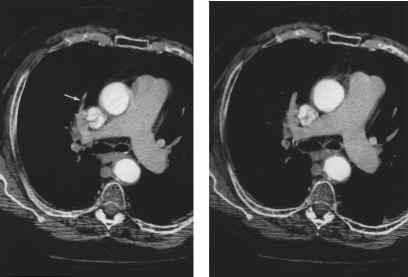 (B) At a window of 700, and a level of 100, a small but definite clot is seen on multiple axial images (arrow). If all the vessels are not well enhanced, either the timing of injection was faulty or there was a mechanical problem with the injection, the catheter, or the veins leading to the right heart. Right heart failure may also delay pulmonary artery opacification. Avoid edge enhancement as used in high-resolution lung algorithms. Edge enhancement causes the margins of the vessels to appear dense. By comparison, the center of the vessel appears more lucent and may be misinterpreted as a PE. A ''smooth'' or ''low spatial frequency'' reconstruction algorithm should always be used. To avoid excessive noise in large patients, especially at the shoulder and hips, use increased kilovolt peaks and milliampere-seconds thicker slices, and decreased pitch. Axial images through the bifurcation of a pulmonary artery often produce the appearance of a central lucency. Workstation paging, above and below, easily identifies these as branch points (Fig. 10). Segmental vessels of the middle lobe, the lingula, the superior segments of the lower lobes, and the anterior segments of the upper lobes tend to undulate in and out of the plane or across the plane obliquely, causing pseudofilling defects. Again, cineviewing on a workstation overcomes this problem (Fig. 11). If the contrast column ends in a sharp meniscus, a PE is likely to be present; if it tails off gradually, it is more likely an artifact. Figure 10 Vessel bifurcation. (A) There appears to be a small lucency in a subseg-mental vessel in the left lower lobe (arrow). (B) Shows vessel bifurcation. averaged ''into'' the adjacent contrast-filled vessel. This is an especially difficult problem at the bifurcation of the right pulmonary artery into the truncus anterior and the interlobar artery and at the origin of the left upper lobe arteries. The lymphatic tissue is usually present over many images and workstation paging usually resolves these issues. It may be especially difficult to distinguish the parallel lymphatic tissue from the wall thickening of chronic pulmonary embolus. Multiplanar reconstructions are especially helpful in solving this problem (Fig. 8). Figure 11 Pseudo-PE due to in-plane vessel. (A) Lucency ''within'' anterior segmental artery of RUL (arrow). (B) At 1.25 mm caudally; the vessel is normal. The scan cephalad to A was no longer in the plane of the vessel (not shown). pulmonary arteries, and are easily misinterpreted as occluded pulmonary arteries. 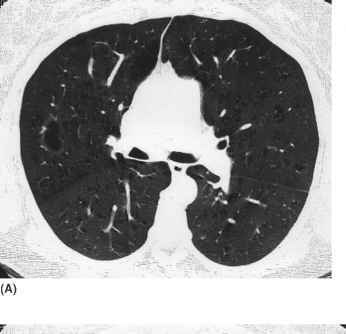 On mediastinal windows, a contrast-enhanced vessel runs directly adjacent to each of these structures and, on lung windows, no air is visible in the expected location of the bronchus (Fig. 12). 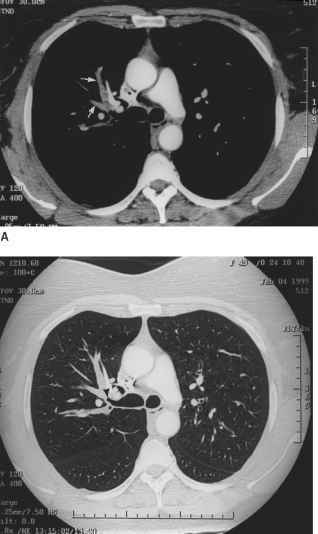 Atelectasis, pneumonia, emphysema, and so on often distorts pulmonary arteries. In general, with cinepaging, one can follow the distorted vessels into the periphery of the lung. In emphysema, the peripheral vessels are markedly attenuated. The loss of peripheral vessels, without a demonstrable, central filling defect, should not be interpreted as a sign of PE. With faster scanning protocols, it is possible to enhance the pulmonary arteries well before contrast reaches the veins on the initial images. This may simulate a PE. Figure 12 Mucus plug. (A) There is a branching soft-tissue density supplying the anterior segment of the right upper lobe (arrows). It has the appearance of a clot-filled vessel. However, the contrast-filled pulmonary artery is immediately medial to this area. (B) On the lung windows, there is no air-filled bronchus to the anterior segment of the right upper lobe. One can actually see the cutoff of the air column to the anterior segment of the right upper lobe (arrowhead).